It’s been raining for a few days now here in Western North Carolina and my rain barrels are full. Yay! This means I’ll have water for my plants and won’t have to rely on city water (that likely contains mystery ingredients). I have two 55-gallon drums and another that is about 30-gallons and then several 5-gallon buckets. Most of them were free or very cheap. How did I do it? I’ll tell you! Some areas won’t allow you to catch and contain your own water from rainfall. It’s a sad, but true fact. Check with your city or county to be sure you won’t be doing something illegal. If you rent, make sure it’s okay with your landlord. 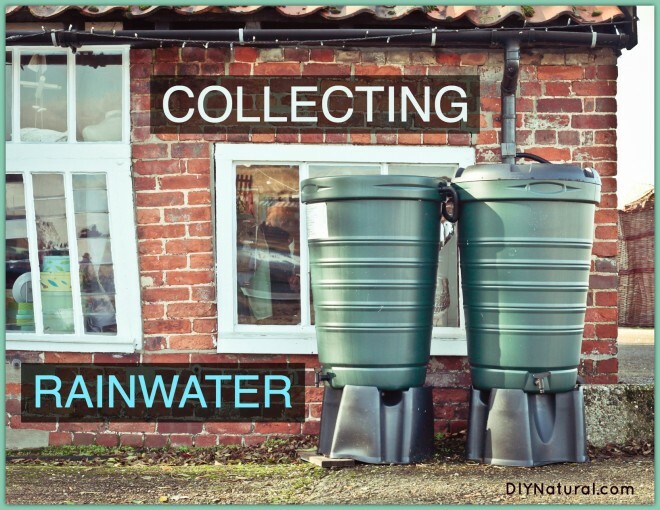 I’m lucky to live in an area where collecting rainwater is legal. You’ll also want to be sure the ground underneath your barrel is stable. We have heavy clay here that will work most of the time, but when it gets wet, as it is now, it can get really mushy. I have my barrels on pallets to make sure they won’t sink. You could also arrange some stone pavers to create a solid foundation for your barrel. Another consideration is placement. You want barrels to be situated under rain gutters near the house, but not so close that they obstruct movement. I had to move mine away from the back door so I could get things in and out of the door. Your rain barrel will fill faster if you use a section of rain gutter that has a downspout coming from the roofline. However, some roofing materials may not be conducive to water collection if using it for animals. Most shingles contain tar and other materials that may be harmful to animals, so you may not want to collect rain from a shingled roof of this type. Water for shrubs and trees from such a source should be fine. If your shingles are all natural, the water running off them may also be suitable for fruits and vegetables. Metal roofs are usually fine for collecting rainwater for plants and animals. Be sure to check with the manufacturer to be sure. Some paints may flake off, but most metal roofs are made to last 50 years or more. Wooden roofs are probably the best to work with as long as the wood isn’t treated. Cedar shakes may leach some cedar oils into the water, but it will be very little and will most likely be fine. Beware of aluminum roofing, most often found on mobile homes. The aluminum can get into the water and is the most undesirable. There are unconfirmed studies of aluminum possibly contributing to Alzheimer’s Disease and is best avoided because of this. Aluminum rain gutters and downspouts can be used because the water spends very little time in them, sometimes touching them very little in its fall. You can buy commercially-made rain barrels that are attractive as well as functional. There are many styles, ranging from barrels that blend in with your landscaping (like this) to collapsible models (like this) that can be moved easily. They usually come with a spout to drain the water and sometimes come with hardware to hook them up to your gutter system. If not, the pieces can be found at your local hardware store or you can purchase the hardware kits here. I couldn’t find the right size funnel for mine, so I improvised by cutting off a 2-liter soda bottle and running duct tape around the gutter and bottle. I have had no problems with leakage. One of my rain barrels was purchased locally from a man who gets barrels from car washes, cleans them out, then adds the necessary hardware. They were priced between $15 and $40 depending on size. I found another one on Craigslist for free. It originally contained windshield washer fluid, so I washed it out well and now it holds plant water. This one had a pump on top that ran like a siphon. Another was purchased from Habitat For Humanity for $25, and came with a screen to keep bugs and leaves out, and a hose on the side to fill buckets or run downhill to the plants. Check Craigslist, Freecycle.org, other local websites, and automotive repair businesses (this is where I got the one that held wiper fluid). Also check with your local extension office. My county extension sells really nice rain barrels for $85. I also use 5-gallon buckets placed out in the yard. If you put them right under the dripline of a tree, you can fill them up in one night. These have no barriers against bugs, so the water will need to be used right away. Sponge or netting – You can also lay a sheet of sponge or wadded up netting over the top of your barrel opening. The rough surface should deter bugs. I would also keep a screen over the top anyway, as birds and other animals will want to drink from standing water. I do what I can to prevent accidental drownings. Algae isn’t usually a concern, but to prevent it you can add a small amount (about a cup to a 55-gallon drum) of hydrogen peroxide to the barrel. Replace occasionally as water is used and the barrel is filled again. There are algae preparations for ponds that may work, such as barley extract, but I don’t have experience with them. Have you set up rain barrels at your home? Tell us how it worked! Great information! Thanks for sharing it. I especially like the 5 gallon bucket idea, as where I live I can’t have rain barrels, but I can try the buckets.